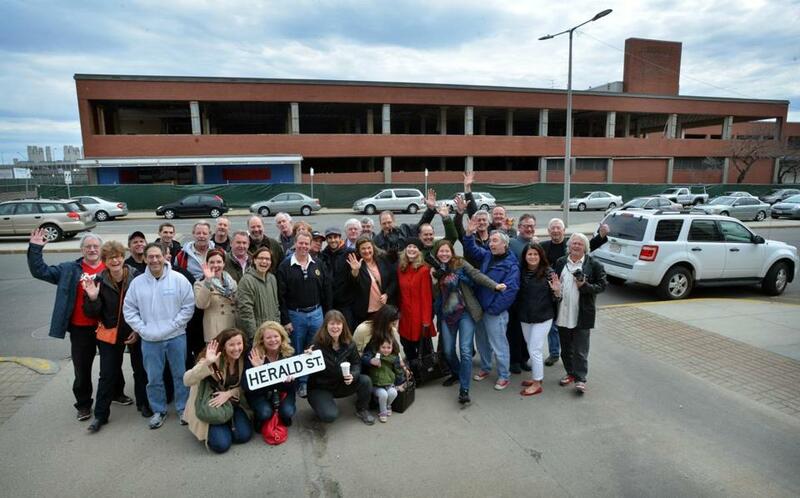 Some of the Boston Herald staffers got together yesterday at the feisty local tabloid’s former South End headquarters to kiss the old dump goodbye. It’s slated for the wrecking ball this week, so about 30 current and former staffers gathered and reminisced at what was once known as Wingo Square, named after the incessant numbers games the Herald ran back in the ’80s to goose circulation. Surprisingly, today’s Herald has no story about the reunion. But crosstown rival Boston Globe does. That seems to be the way Heraldniks still feel, except in a nicer building. Regardless, the Globe reports that “[a] formal farewell is planned for Thursday, when speakers, including Herald columnist Joe Fitzgerald, will pay tribute to the site.” Hard to believe the Herald won’t cover that one. Tip o’ the pixel to Dan Kennedy’s Facebook post. This entry was posted on Monday, April 8th, 2013 at 6:50 pm and is filed under Uncategorized. You can follow any responses to this entry through the RSS 2.0 feed. You can leave a response, or trackback from your own site.